It’s been a while since I’ve been super excited about a Target collaboration, but the superstore revealed it will partner with the Finnish clothing line Marimekko for its latest limited-edition collection. In addition to the usual apparel and home good items, the collection from the celebrated design house will also include some items like paddleboards, hammocks and parachutes. The inspiration for the collection include both the Finnish summer – when the sun stays out until close to midnight – and Finnish culture, which weighs heavily on gatherings among family and friends. Look for the full line to go on sale at Target stores and online April 17. Summer here we come! I’ve been a long time fan of Warby Parker, not just because they have amazing frames at wallet-friendly prices, but because they are a socially responsible company with their ‘every pair purchased, a pair is distributed to someone in need’ program. Whether it be interiors or fashion, I am always drawn to anything with modern vintage flair, so I’m excited to see WP’s new Concentric Collection. Their latest collection is all about complement and contrast, with a bit of luxury and a subtle dash of color. These are a few of my favorite frames for eyeglasses or sunglasses. Most of the boxes have been cleared out of the house and I finally have the mental (and actual) space to get into the Fall mood. 1. This everlasting arrangement will keep pretty on your table for as long as you want. 2. I took a few liberties with this recipe, but these chai spiced sugar cookies are yum-um. 3. Been looking for a new hat and I think this one is it! 4. 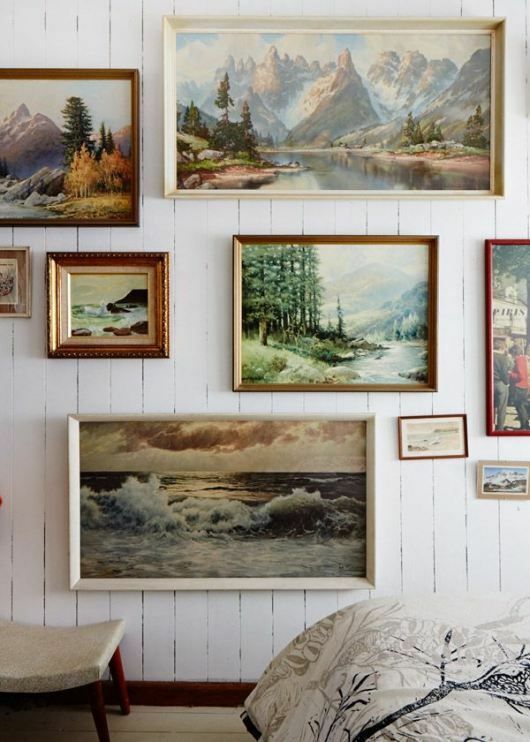 Totally stealing this art idea for my guest room which has a bit of a camp-y theme going on. Just in case you missed it, I was on 7×7! Check out my feature here. Thank you to Bib + Tuck for the feature! If you’re not familiar with B+T, it’s a shopping site that allows you to shop other ladies’ closets, sell goods from your own closet, all without spending a dime. Sounds like a dream come true. You can check out my interview and shop my closet here. It was not that long ago the Shipley & Halmos boys were over at my house, telling me about this pop-up concept they had in the works. Their temporary store is set among the best designer knockoff and tourist-y merchandise vendors on Canal St., shady landlord included. Among the racks are Spring ’14 menswear essentials and a clever assortment of very S&H souvenirs. I personally need to get my hands on the “I Went to Canal Street & All I Got Was Mugged” mug. The store opened up just in time for New York Fashion Week and will be open through February 23rd. Get your shop on! The Shipley & Halmos Pop Up Shop is located at 385 Canal Street in NYC.